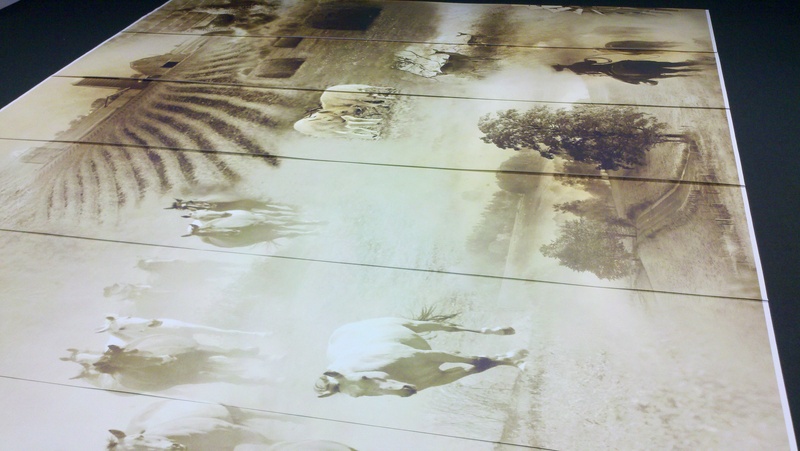 We just shipped one of the most spectacular wallpaper murals we have ever printed. I’m not sure the picture of the wallpaper mural does it justice, because it was 16×50′ and we could only lay half of it out on our floor at one time. This custom wallpaper mural is going into a school in Texas, and is meant to inspire young people about their state. Boy, does it ever! It’s in sepia tone, and shows everything from agriculture to ranching to oil exploration. The artwork we were given is spectacular, and it sure made some beautiful custom printed wallpaper. We can’t wait to see a picture of it installed. This entry was posted in Custom Printed Wallpaper and tagged custom wall mural, custom wallpaper, digital printed wallpaper, digitally printed wallpaper. Bookmark the permalink.